Why is Kona coffee so expensive? This is where you will find us every Sunday. 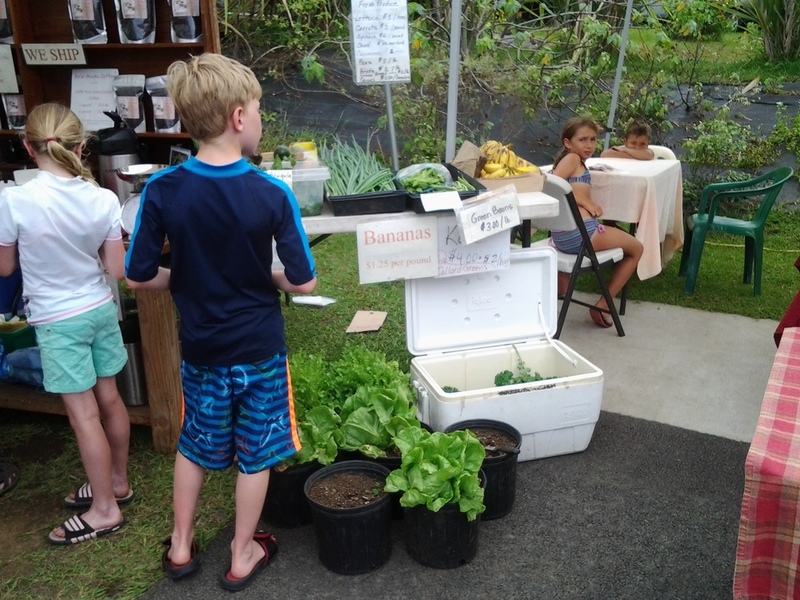 The South Kona Green Market was formed by like-minded farmers and artisans who came together looking to create a venue in which they could showcase and sell their farm produce and handicrafted items. 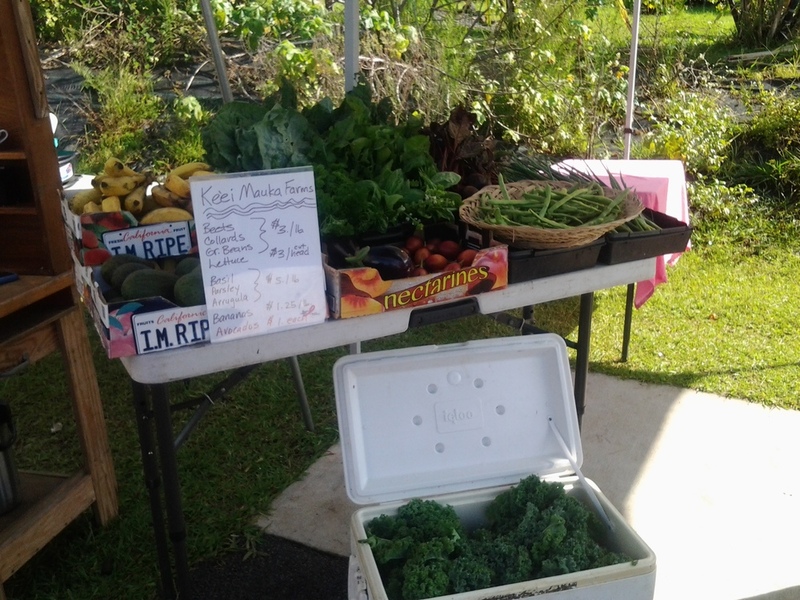 All items at the Market are either grown or made by the farmers themselves, NO reselling. 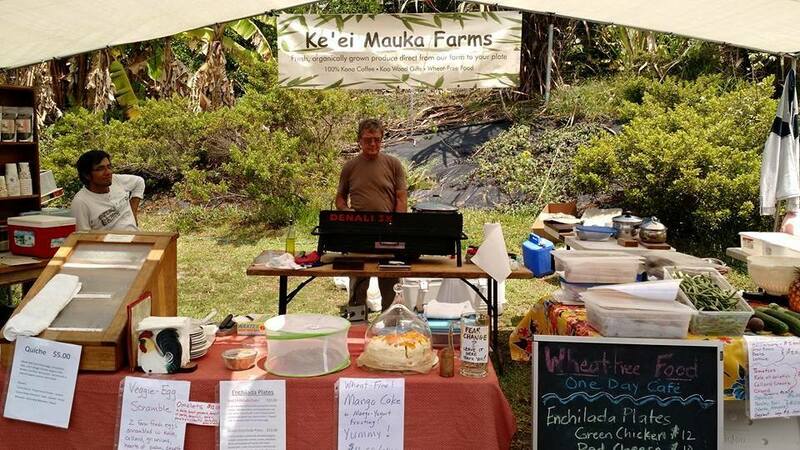 Keei Mauka Farms was part of that group and we have stayed throughout changes in locale and in vendors that have, over the course of several years, culminated in a vibrant, weekly South Kona Community event complete with fresh vegetables, delicious foods, and live music. Many folks come not just to shop, but to stay - eating, listening to music and chatting with their friends - whiling away the day under beautiful Kona skies. We, too, have evolved and expanded. From a small booth of bead work to a double sized booth of produce, coffee, koa woodwork and food made fresh with the our farm bounty—the One Day Café was born. Every week we service an eclectic mix of South Kona locals and tourists from our fabulous wheat-free menu. It features enchiladas made with fresh local organic chicken, assorted flavors of quiche made with our farm fresh eggs and farm vegetables. We have pastries that feature local fruits (my Mango Cake is to die for!) 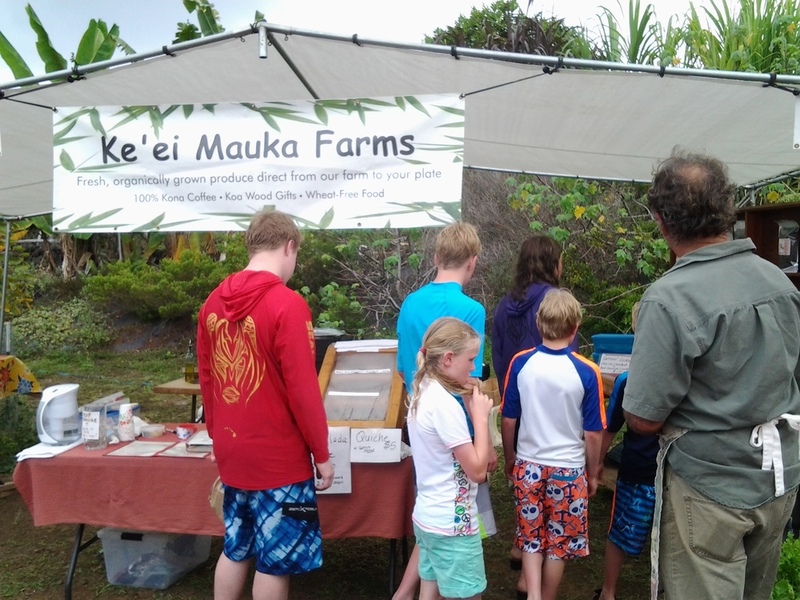 and locally grown macadamia nuts and chocolate (the chocolate chip cookies are the best deal in the place!). We also unabashedly say that we have the best 100% pure Kona Estate Coffee to be found, by the cup or by the pound. So every week, we pack up the café and set it up on the grounds of the Amy B. Greenwell Botanical Gardens, where the event is now held. Our additional interpretation of the “green” in South Kona Green Market is to reduce waste, so we serve our patrons using reusable flatware, cups, and plates. It is indeed a mini café for which we prepare for all week. 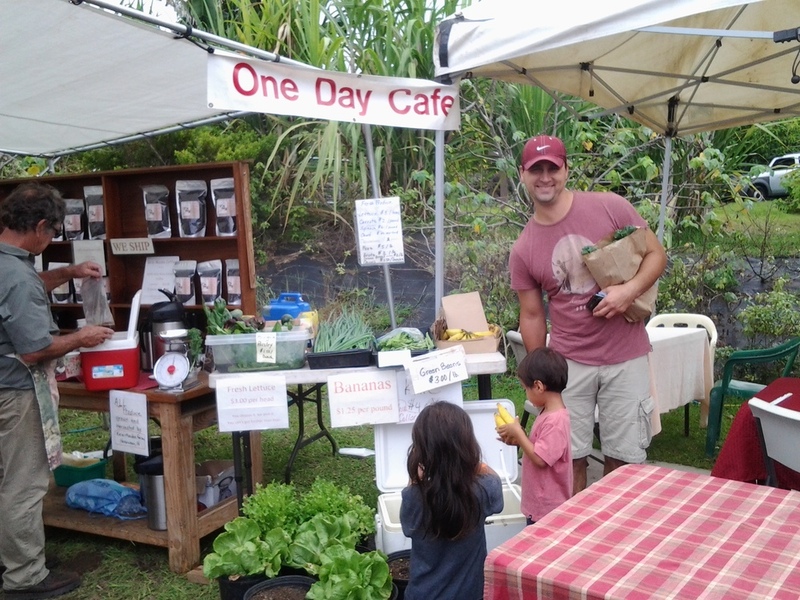 If you find yourself in Kona, come and visit, or should I say, find your way, stay and play all day at the One Day Café. We owe a good part of the success of our farm to our gentlemen from MESA. MESA, the Multi-cultural Exchange for Sustainable Agriculture, is a small, non-profit organization with offices in Berkeley, California. Their mission is to promote agricultural information exchange between countries. We have participated in their program for eight years now and have met some of the most knowledgeable, competent, hard-working, committed, and amiable young men and women we have ever known. Every year we receive a new steward, who stays with us for the year and works on our farm. We learn new (but very ancient) ways to grown crops sustainably, and in return, give our stewards a look at how farms work in America and how to add value to crops by creating retail products. Most of these young men already have university degrees in agriculture and take back what they learn to improve their own farms and communities: An incredible win-win situation for all. All of our stewards have come from South America-- Ecuador and Peru. Most of them have come back to stay with us another year. We whole-heartedly welcome them into our family and onto our farm. MESA can be found at www.mesa.org should you want additional information. They are always searching for new hosts.